The What: The SDVoE Alliance and IDK Corporation have announced a new product that links Dante audio networking technology with the SDVoE ecosystem. IDK’s new IP-NINJAR/Dante Audio Bridge (model: NJR-AB08DAN) transcodes audio signals directly between the SDVoE and Dante protocol environments. The What Else: Audio signal transport is enabled from NJR transmitters to Dante devices and from Dante device to NJR receivers. 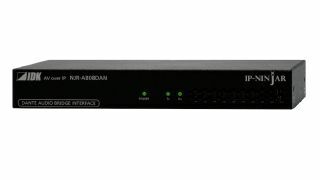 Each NJR-AB08DAN can receive up to four audio streams from IP-NINJAR transmitters outputting up to eight channels in Dante protocol. Additionally, each bridge can accept up to eight channels of audio from Dante sources, outputting IP-NINJAR (SDVoE) protocol in up to four audio streams. This feature enables Dante audio embedding on HDMI signals and de-embedding through analog audio outputs at IP-NINJAR receivers. The Bottom Line: The bridge eliminates third-party converters and processors, which enhances system design flexibility while streamlining architecture, eliminating interoperability guesswork, and optimizing reliability.